Today I trekked out to my all time favorite corner in Oakland. Why is it my favorite? There is an awesome burger joint (fried plantains! ), a cafe, a cupcake shop and a yarn store. I cannot think of a better way to spend my day than wandering between these establishments. Today I made the trek to attend a(nother) drop spindle class at A Verb For Keeping Warm. This time the lovely Miss J accompanied me. We took our spindles and learned how to use them. Mostly. We made very poor yarn, uneven and slubby, but, hey! We made YARN! And, true to my nature, I wandered out of the shop with some souvenirs. A skin of Manos del Uruguay, a Coco Knits pattern (how darling is that?) and four ounces of Blue Faced Lancaster top to run through my spindle. 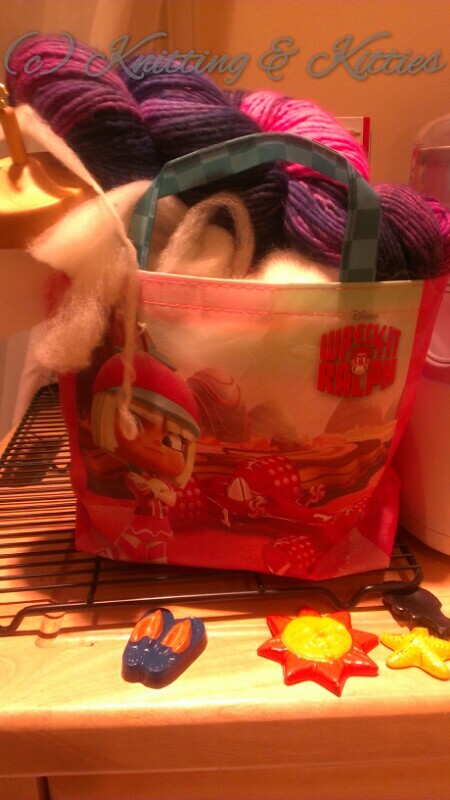 My over burdened Wreck It Ralph bag (plus four mini cupcakes for… the family, yeah. Family.) trudged home. 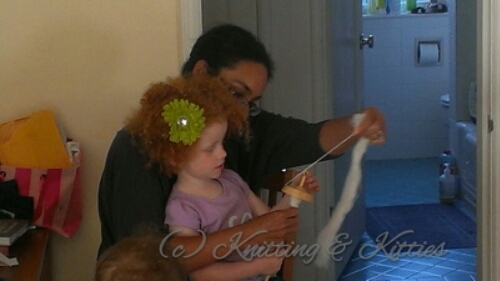 We spun about a yard, taking turns spinning and drafting (pulling the fibers so they can twist). The yarn we spun together is slubby and uneven and I love it. Then Teen Titans came on and she ran off. Robin is her first love, so I totally understand. It was fun. I’m hoping to get my BFL spun so I can ply that bad boy and knit something. I have no idea what. This entry was posted in class, spinning, Yarn. Bookmark the permalink.